There has been an increasing consciousness on environmental awareness over the years. Modern transport systems afforded more people the opportunity to travel and appreciate ecologically rich environments. This eventually leads one to think about the possibility of living in such places, within one’s locality or even in the urban settlement. This might be wishful thinking for those who are so accustomed to the barren and enclosed lifestyle often characteristic of city life. However, if we only take a step back and observe the outdoors, one will realize that we do not live in isolation. There is wildlife in our localities, near and within the urban centers! Wild birds abound in places where they are “welcome”. Welcome here means they have safe places to roosts (rest), food to eat and open space to forage and live a “normal” life. Ironically, we humans share the same longing for these basic necessities to live a normal and healthy life. 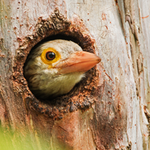 Wild birds in general share the same basic lifestyle as humans. 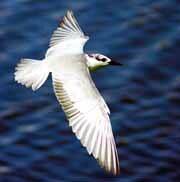 Most of them can fly and therefore can move freely from one place to another in search for food, roosting and breeding areas (suitable habitat). In other words, their presence in our locality is a good indicator that the place we shared with them is still suitable for healthy and comfortable living. On the other hand, their total absence in our area can be a tell tale sign that something is wrong. In fact it should be a cause for alarm on possible hazards that may affect humans. Migratory birds are exposed to various environmental conditions as they travel, rest and navigate across islands and continents. It is for this reason that migratory birds have become an important indicator and Ambassadors of the changing environment. •	Key and notable information on the individual birds. Many of urban dwellers are often deprived of opportunities to explore distant national parks. 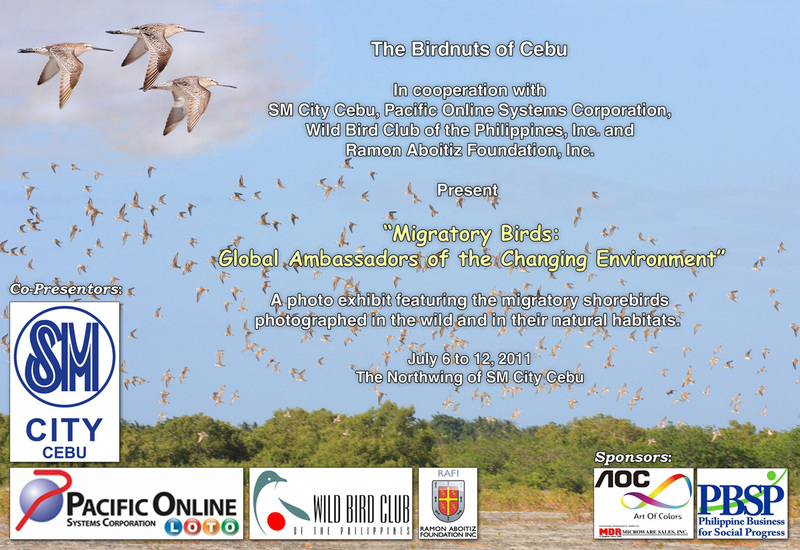 The photo exhibit at SM City Cebu Northwing will feature visiting migratory birds taken in the locality of Cebu. The photos taken in the locality will highlight the fact that we don’t have to go very far to appreciate these magnificent long-distance fliers. By instilling a mindset for coexistence, rather than a life of separation or isolation, we should be able to attain a society that is tolerant and sensitive to the needs of wildlife in a shared environment. This in return should make us better steward of the natural resources we borrowed from the future generations. After all, good environmental stewardship will be measured not on the amount of resources we remove and destroy but to what we consciously leave intact for the generations to benefit and enjoy. 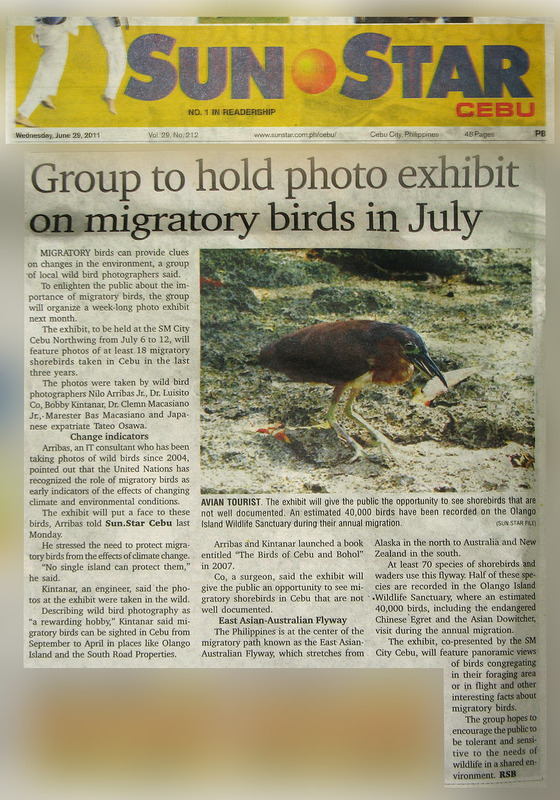 •	Wild Bird Club of the Philippines, Inc.
•	Ramon Aboitiz Foundation, Inc.
•	MDR Microware Sales, Inc.
4. Dr. Clemn Macasiano, Jr.
Last Edit: Jul 7, 2011 18:11:40 GMT by Nilo Arribas Jr.
Congrats to the Cebu Birdnuts. Great mileage for our feathered friends. Yes, I agree with Telyds and Neon. I believe it's about time we become more serious in using our photographs to move people into caring for the survival of our avian treasures and their vanishing natural habitat. Conservation photography is the way to go, photography with a mission. Yeheyyy! Congrats Cebuano, or rather Visayan (you got Ilonggos there too), Birdnuts! 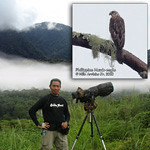 Indeed, I fully agree with Telyds, Neon and Rey... We have to use our bird photographs to instill awareness and positive action towards conservation of both wildlife and environment, birds in this particular instance. I salute you all, Birdnuts of Cebu! In behalf of my colleagues, Nilo, Tateo, Doc Louie Co, Doc BoyMac, and Marester, thank you kindly for your support! We launched the exhibit right on time, and everything went smoothly; the cutting of the ribbon, unveiling of photos, the talks, and finally the Poetry Reading - all went well and contributed to a very successful opening. Once again, thank you from all of us! Big Congratulations to Nilo, Tateo, Doc Louie Co, Doc BoyMac, and Marester! Another hallmark to remember and emulate. Big big congratulations!